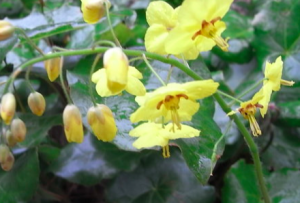 We love this wide spreading and tough barrenwort. 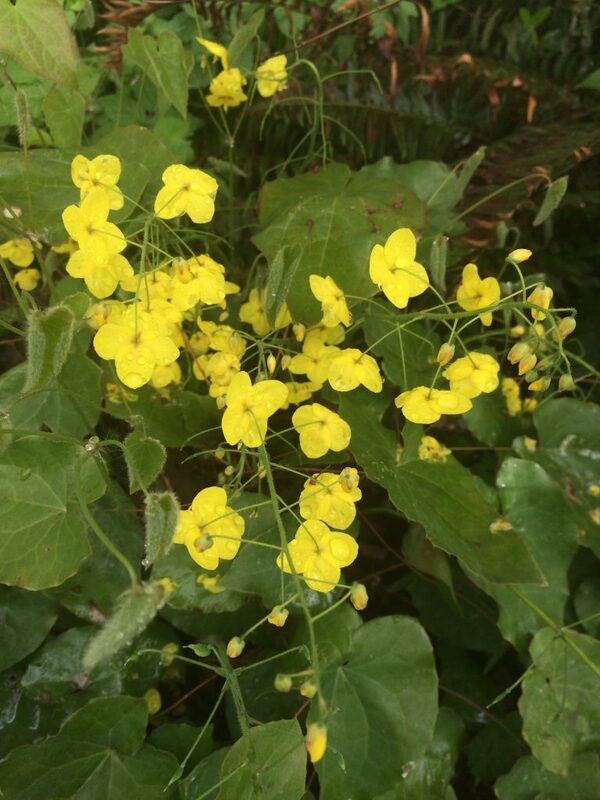 Prior to the new foliage emerging in early spring 18″ spikes arise clad in wonderful sulfur yellow almost transparent flowers. The individual flowers are large for this genus. The new growth that follows emerges amber and red before making its way to its green summer hue. Runs underground to form large stands, give it room – or at least expect this. Mostly evergreen- to be honest that foliage looks pretty beat up by spring so we advice removing it in February prior to spring growth. Part shade ( to a surprising amount of sun – if you water and are brave) in rich, deep, moisture retentive soil. Once of the most drought adapted of the genus making due with light summer water- which spurs it to spread. Ground cover under dense tree shade, dry hillsides, woodland gardens. High deer resistance. Long lived.